Florida Keys Kayaking and Kayak Tours We specialize in Lower Florida Keys backcountry adventures including: * Half and Full Day Kayaking Nature Tours * Shallow-water Skiff Eco-tours * Short and Long Term Kayak Rentals * Backcountry Sailing Catamaran Cruises * Shallow-water Fishing BIG PINE KAYAK ADVENTURES Inc. Captain Bill Keogh has lived in the lower keys for more than two decades and has made his living on or in these waters as a naturalist guide, educator and professional photographer. He has been published in numerous books, magazines and publications throughout the world and co-produced the book written by Jeff Ripple on the natural history of the Florida keys. National Geographic, The Nature Conservancy, World Wildlife fund, Florida Keys National Wildlife Refuges, and many others have used his images. 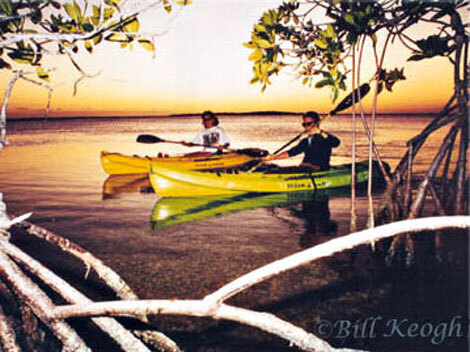 Captain Bill Keogh's LATEST BOOK: "The Florida Keys Paddling Guide" is hot off the press. Learn about the natural history of the keys and details of launches and paddling routes from Key West to Key Largo. Biological line illustrations, photos by the author, a sea turtle guide, birding checklist, tide information and a ton of other informative tid-bits make this a diverse and handy little guide. Call the author (877-595-2925 or 305-872-7474) for a signed copy to be delivered to your door for only $22 including tax and shipping. Captain Bill Keogh has been recommended by the New York Daily News, Boston Globe, Lonely Planet, Outside Magazine, Fodor's Guides, CNN Hotspots and many others. We were recently featured in 2003 by Islands magazine (January-February 2003 issue) and Travel & Leisure (March 2003). Explore...the shallow waters surrounding the mangrove islands of the Great White Heron and Key Deer National Wildlife Refuges, using safe and stable sit-on-top kayaks. Relax...while we move slowly and observe closely the colorful web of life that inhabits the mangrove forests, sponge flats, grass flats and incredibly blue sky of the backcountry. Join us...on one of our morning, afternoon or sunset tours for a unique nature experience. 3 Hour Tour @$50 per person Contact Us . ::.Kayak Group Tours. ::.Kayak Rentals.::. Kayak Fishing.::. . ::.Fishing Charters. :: Custom Motor Boat Excursions.::. . ::.Contact Us.::.Directions. :: Home.::. KAYAK RENTALS Rent a kayak for a 1/2 day, full day or multiple days. We will deliver and pick up our boats at any one of the many local boat ramps between Sunshine Key and Cudjoe Key. If you prefer to have the boats delivered to where you are staying we can do that too. All rentals include kayak(s), paddles(s) and PFD's. We also have a complete line of kayaks available at the Old Wooden Bridge Fishing Camp which is near some of the best paddling in the lower keys. Self-guided kayak charts are available and the hours are from 8-5 daily. Rent & Ride is becoming a popular service for locals, returning guests, and the independent adventurists. We will ferry you and our Kayak(s), aboard our shallow water power boat, into the Backcountry. From there we will leave you with explicit instructions on how to navigate yourself back to port. This service allows you to paddle the shallow waters along the mangrove islands at your own pace.